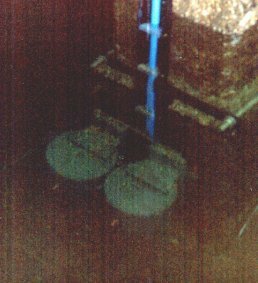 The full-tide bubbler system normally consists of two independent measuring points, unless a float gauge exists, then this would constitute the second measuring system. The pressure points which you can see mounted underwater in the photograph are similar in appearance to an inverted bucket with a copper nozzle mounted on the side. This nozzle is the actual measuring point. A low flow of dry air (normally 7 cm3 per minute) is fed down an air tube to the top of the pressure point. When the air pressure in the air line equals the pressure exerted by the column of water above it, then the excess air is released as bubbles through the copper nozzle. This means that the pressure in the air line is proportional to the weight of the water column.